Republic Act No. 6732 allows the administrative reconstitution of original copies of certificates of titles lost or destroyed due to fire, flood, and other force majeure, if at least ten percent (10%) of the total number of certificates of titles in the possession of the Office of the Register of Deeds, and no less than five hundred (500) certificates of titles, were lost or damaged. The full text of RA 6732 can be found below. “Sec. 110. Reconstitution of Lost or Destroyed Original of Torrens Title. 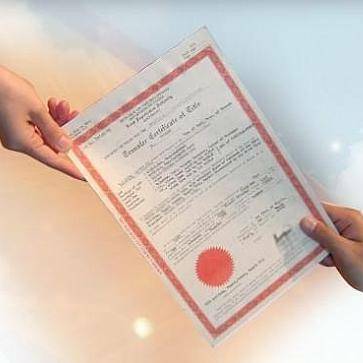 – Original copies of certificates of titles lost or destroyed in the offices of Register of Deeds as well as liens and encumbrances affecting the lands covered by such titles shall be reconstituted judicially in accordance with the procedure prescribed in Republic Act No. 26 insofar as not inconsistent with this Decree. The procedure relative to administrative reconstitution of lost or destroyed certificate prescribed in said Act may be availed of only in case of substantial loss or destruction of land titles due to fire, flood or other force majeure as determined by the Administrator of the Land Registration Authority: Provided, That the number of certificates of titles lost or damaged should be at least ten percent (10%) of the total number in the possession of the Office of the Register of Deeds: Provided, further, That in no case shall the number of certificates of titles lost or damaged be less than five hundred (500). “(6) That real estate taxes have been fully paid up to at least two (2) years prior to the filing of the petition for reconstitution. Section 3. Immediately after the loss or destruction of titles mentioned in Section 2 hereof, a true, complete and faithful inventory of all books, titles, documents, cash and property in the Registry of Deeds concerned shall be prepared by the Land Registration Authority through the newly designated reconstituting officer or Register of Deeds. Said inventory, duly signed and certified under oath by the Administrator of the Land Registration Authority, shall be published in a newspaper of general circulation in the province or city where the loss or destruction of titles occurred. Section 4. All reconstituted titles shall be reproduced by the Land Registration Authority in at least three image copies or in whatever means by which the original can be reproduced, one copy to be kept by the Land Registration Authority, the second copy to be kept by the National Library Archives Division, and the third copy to be secured in a government fire-proof vault, preferably in the Security Printing Plant of the Central Bank. Such image copy of the original copy of the reconstituted title shall be considered after due authentication by the Land Registration Authority, through the Register of Deeds in the province or city where the land is located, as a duplicate original, and as an authorized source or basis for reconstitution together with the sources enumerated in Section 2 and 3 of Republic Act No. 26. Section 5. After reconstitution, said owner’s duplicate or co-owner’s duplicate exhibited as basis for the reconstitution shall be surrendered to the Register of Deeds and a new certificate of title issued in lieu thereof, the original of which shall be kept by the Register of Deeds and the owners duplicate delivered to the registered owner. Section 6. Section 6 of Republic Act No. 26 is hereby declared inoperative. (3) The immediate reporting by the reconstituting officer or Register of Deeds to the Secretary of Justice and the governor or city mayor concerned on any verified complaint presented to him. Section 9. The Land Registration Authority Administrator may review, revise, reverse, modify or affirm any decision of the reconstituting officer or Register of Deeds. Any appeal shall be filed within fifteen days from the receipt of the judgment or order by the aggrieved party. SECTION 10. Any interested party who by fraud, accident, mistake or excusable negligence has been unjustly deprived or prevented from taking part in the proceedings may file a petition in the proper court to set aside the decision and to reopen the proceedings. The petition shall be verified and must be filed within sixty days after the petitioner learns of the decision but not more than six months from the promulgation thereof. Section 11. A reconstituted title obtained by means of fraud, deceit or other machination is void ab initio as against the party obtaining the same and all persons having knowledge thereof. Section 12. Any person who by means of fraud, deceit or other machination obtains or attempts to obtain a reconstituted title shall be subject to criminal prosecution and, upon conviction, shall be liable for imprisonment for a period of not less than two years but not exceeding five years or the payment of a fine of not less than Twenty thousand pesos but not exceeding Two hundred thousand pesos or both at the discretion of the court. Any public officer or employee who knowingly approves or assists in securing a decision allowing reconstitution in favor of any person not entitled thereto shall be subject to criminal prosecution and, upon conviction, shall be liable for imprisonment of not less than five years but not exceeding ten years or payment of a fine of not less than Fifty thousand pesos but not exceeding One hundred thousand pesos or both at the discretion of the court and perpetual disqualification from holding public office. Section 13. All acts, laws, decrees, executive orders, or parts thereof which are inconsistent with any of the provisions of this Act are hereby repealed or modified accordingly. Section 14. This Act shall likewise cover administrative reconstitution of copies of original certificates of titles destroyed by fire, flood or other force majeure within a period of fifteen years before the effectivity of this Act. Section 15. This Act shall take effect upon its publication in three newspapers of general circulation.